North Korean leader Kim Jong-un has bragged that his country has achieved full nuclear statehood after successfully testing a new missile capable of hitting anywhere in the United States. The country abruptly ended a 10-week pause in its weapons testing on Tuesday when it fired off its most powerful intercontinental ballistic missile yet. It poses a new challenge for President Donald Trump who has vowed not to let North Korea develop nuclear missiles that can hit the US mainland. After watching the successful launch of the new type ICBM Hwasong-15, Kim Jong Un boasted about its success, according to state television presenter Ri Chun-Hee. 'Kim Jong-un declared with pride that now we have finally realized the great historic cause of completing the state nuclear force, the cause of building a rocket power,' the presenter said. 'The great success in the test-fire of ICBM Hwasong-15 is a priceless victory won by the great and heroic people of the DPRK,' she added, using the official abbreviated name for North Korea. The Pentagon said the test missile traveled about 620 miles and landed within 200 nautical miles of Japan's coast. 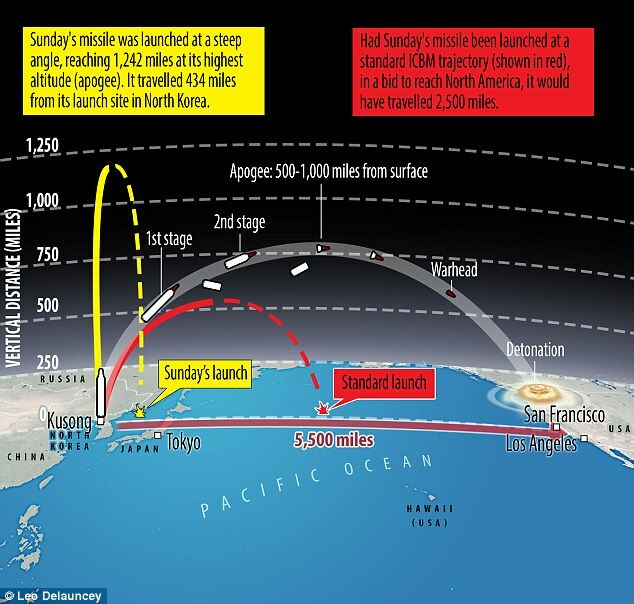 In a broadcast on state TV, North Korea said the missile reached an altitude of around 2,780 miles - more than 10 times the height of the international space station - and flew 600 miles during its 53 minute flight. 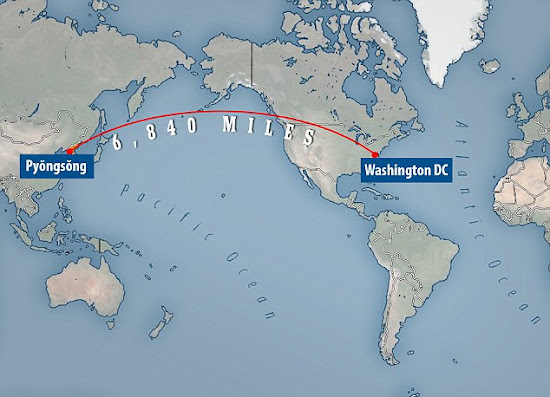 Trump vowed on Tuesday to 'handle the situation' as one physicist said the missile appeared to have a realistic range of just over 8,000 miles, which means Washington D.C. is now in range of Kim's attacks - and that Australia and Europe are too. 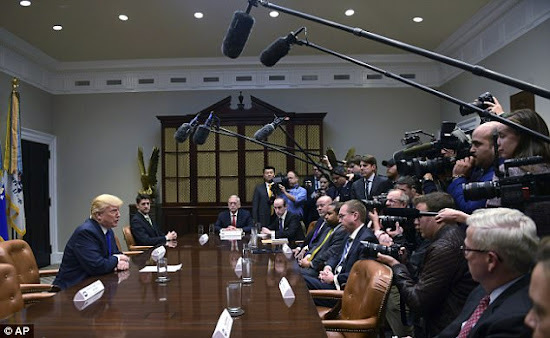 The US President offered no details about how he would deal with the situation, which threatens to escalate into a nuclear crisis on the Korean peninsula – and could rope other regional powers into war. 'A missile was launched a little while ago from North Korea. I will only tell you that we will take care of it,' Trump told reporters in the Roosevelt Room of the White House a few hours after the missile streaked across Korean and Japanese skies at 745 miles per hour. North Korea's immediate neighbors were less restrained with Japanese Prime Minister Shinzo Abe calling the test an intolerable and 'violent' act and South Korean President Moon Jae-In condemning Pyongyang's 'reckless' behavior. The White House said Trump was notified immediately after the missile was fired, suggesting that the news interrupted a meeting with Republican senators on Capitol Hill. '@POTUS was briefed, while missile was still in the air, on the situation in North Korea,' press secretary Sarah Sanders said in a tweet. U.S. Ambassador to the United Nations Nikki Haley and her counterparts from Japan and South Korea will hold an emergency Security Council meeting on Wednesday afternoon. Trump, in the midst of tense budget negotiations with Congress, stressed the need for improved military readiness - tying Tuesday's missile launch to his request for more defense spending. 'A lot of things have happened, even over the last two hours, with respect to the missile launch. We want our military funded, and we want it funded now,' he said. It comes as Hawaii has begun renewed tests of its a Cold War-era nuclear early-warning system. The warning tone is set to be tested on the first business day of every month starting from December. 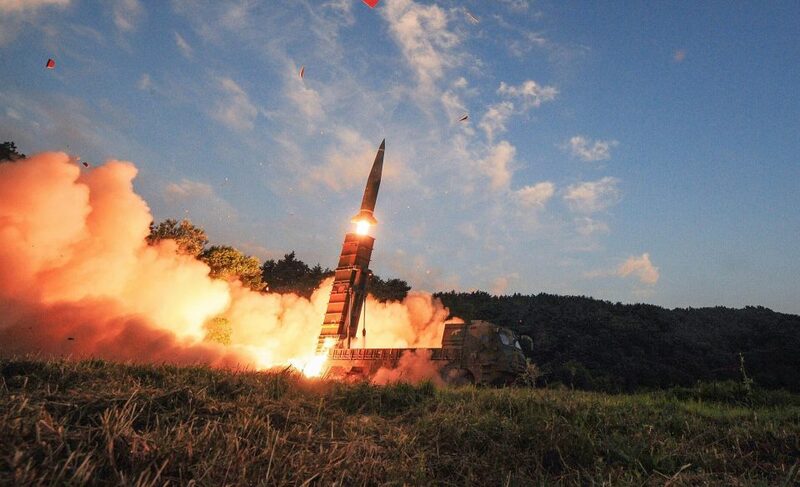 The missile was launched eastward from Pyongsong in North Korea's South Pyongan Province in the middle of the night local time, according to a statement issued by the South Korean Military's joint chiefs of staff. Pentagon Spokesman Col. Robert Manning said in a statement that the launch, at about 1.17pm, was an intercontinental ballistic missile (ICBM), according to the Defense Department's initial analysis. 'The missile was launched from Sain Ni, North Korea, and traveled about 1000 km before splashing down in the Sea of Japan, within Japan's Exclusive Economic Zone,' Maness said.